Performance Measurement System Is Public Sector’s Best Tool For Team Alignment and Public Reporting | Transforming Leaders. Transforming Organizations. Producing Breakthrough Results. How is it feasible for a public sector organization to demonstrate both a high-quality customer experience AND value to taxpayers? TransPro helped a mid-size transit agency in Florida do just that with the introduction of a robust organization-wide performance measurement system. TransPro’s performance management system allows goals to cascade up and down the organization, ensuring alignment on work that matters most. 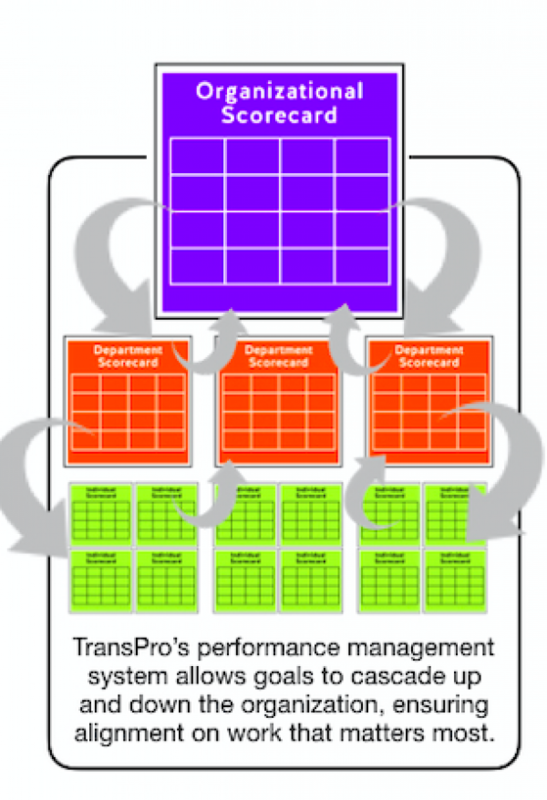 TransPro worked with the agency to develop an organizational performance scorecard. The scorecard provides a dashboard view of performance across five strategic pillars rolled up to a single number on a 100-point scale. TransPro facilitated sessions to determine the overall priority of each of the strategic pillars so that the agency could measure what matters most for the achievement of success. A weight for each metric that reflected the priorities was then developed. Building on the success of the organizational scorecard, TransPro worked closely with management and staff to develop departmental performance scorecards aligned with the organizational performance scorecard. This system allows organizational goals to cascade down, and for departmental results to cascade up, ensuring that the entire organization is aligned and working toward common goals. Scorecards were then used as a foundation for a redesigned performance evaluation process. Starting with the CEO’s evaluation, and later expanded to all employees, the new tool links an employee’s individual performance to the achievement of departmental and organizational goals. Today it is possible for the agency’s board, management team, customers, community, and elected officials to easily gain an at-a-glance view of the agency’s performance and the value it provides. The agency’s board, management team, and staff have embraced the new system for its clarity and effectiveness of communicating performance expectations and results.